Welcome to East Coast Oral Surgery! Atlantic Canada’s most trusted Oral Surgery clinic! East Coast Oral Surgery is located in Moncton, New Brunswick, approximately 5 min from downtown. 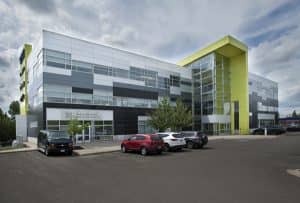 Located at 585 Mapleton Rd, this state of the art facility boasts some of the most technology-advanced equipment in dentistry. Dr Nach Daniel, Dr Eric St-Germain and Dr. Karim Al-Khatib are board-certified Oral and Maxillofacial surgeons providing a full range of services with the highest standards. Using the latest surgical techniques and state of the art equipment, they perform Dental Implants (Single Implants, Multiple Implants, All-on-4® treatment concept, Zygomatic Implants), Wisdom Teeth Removal, Bone Grafting, Corrective Jaw Surgery, and many other maxillofacial procedures. For more info on the procedures performed at East Coast Oral Surgery, check out our services section: click here. We look to make travel dentistry easy and accessible to all patients. 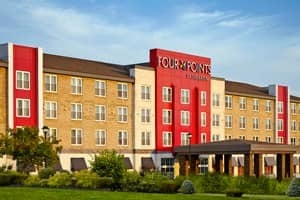 One of our trusted partners the ‘’Four Points by Sheraton Moncton’’, located directly behind our building is happy to provide better rates to our traveling patients. Our staff will be happy to provide this information to you. For more info on the ”Four Points by Sheraton Moncton” hotel, click here. We understand that commuting through a new city can be confusing, but we want to assure you that our well trained staff will be able to assist you every step of the way. If you are traveling from out of town, and would like to get some more information, please give us a call 1-506-859-7200.